The conflict in Ukraine has been substantially escalated by NATO. Currently, NATO views Russia as an opponent and holds Russia and Vladimir Putin responsible for almost everything that happens in the conflict in the Ukraine. The EU’s actions – the agreement of an association with Ukraine, including a military component – and the “Special Agreement” between Ukraine and NATO are hardly deescalating processes and neither is the whole Eastern expansion of NATO. In addition, the verbal armament of NATO against Russia is frightening. 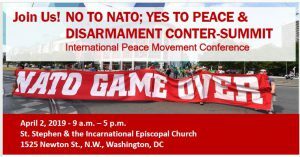 The annual meeting of the international network “No to War – No to NATO” is against any form of military intervention. We reject the planned opening of further NATO military bases and the deployment of soldiers from NATO member states to Eastern Europe as it unfortunately makes a war more likely. Instead of opening new military bases it is the closing of bases that is necessary. According to the will of Anders Fogh Rasmussen, the General Secretary of NATO, the NATO Summit should agree a coordinated increase of military spending by its member states. 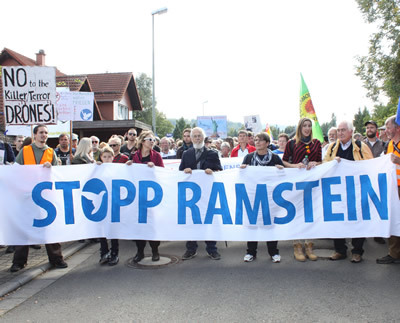 Rasmussen has proposed that every member state should increase its spending on arms and the military to 2% of its GDP. We are strongly opposed to this step up in the arms race. It is disarmament not armament that is the order of the day. A new ‘response troop’ consisting of 4000 soldiers, to be led by Great Britain, is to be established by NATO. They will be able to be deployed to eastern NATO member states within a few days. We reject this rapid force and view it as a new step increase in armaments. It has become increasingly obvious that the missile ‘defense’ shield of NATO currently under construction is to be directed against Russia. We repeat our criticism of the missile defense shield. This weapons system is further escalating the situation with Russia. Instead of being disarmed and destroyed, NATO’s nuclear arsenals of USA, Great Britain and France, are set to be ‘modernized’ (as are all the nuclear arsenals worldwide). The modernization of nuclear weapons further endangers the world. NATO is an international military organization that continually brings insecurity not security to the world. Discussions within NATO on a global (militarized) international system are not helpful. We call for the abolition of NATO.